I have a good idea for a restaurant. You remember that dinner scene with the Lost Boys in Hook? 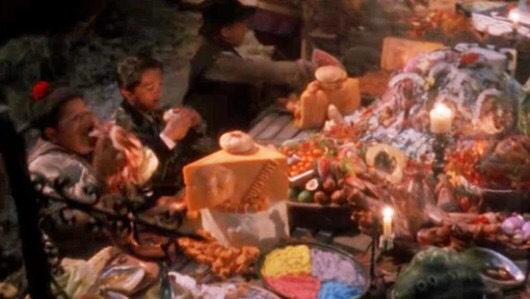 The one where Robin Williams as Peter Pan regains his imagination and an amazing feast appears before them, you remember that? My restaurant will recreate that wonder. You start by approaching a large communal table. You’ll sit right next to strangers. It’s real friendly like. The servers will bring out a bunch of empty plates and dishes and put them on the table. There’s about five minutes of pretending to eat, then suddenly the empty plates and dishes are replaced with real food. Of course the food is all inspired by the food that appears in the movie. All the different types of meat and fruit, the hunk of cheese with Thud’s face in it, the crazy colered pie things, cups of hot cocoa with heaping servings of whipped cream, it’s all there. Everyone eats their fill. The feast ends with a food fight. It’s a little wasteful but it’s worth it.